BOLT AND CARRIER ASSEMBLY. Provides stripping, cambering, locking, firing, extraction, cartridges using the drive springs and projectile propelling gases for power. 0 CHARGING HANDLE ASSEMBLY. 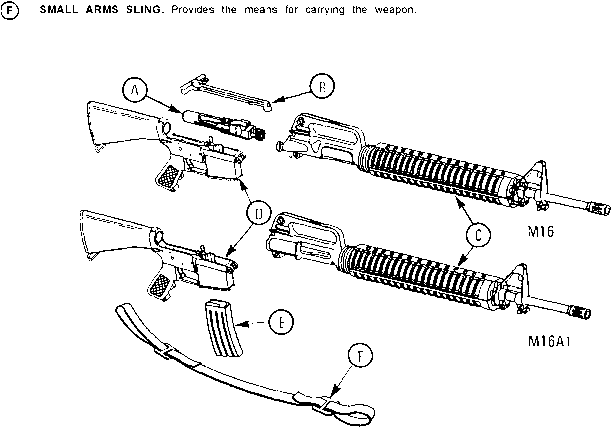 Provides initial charging of the weapon. The charging handle latch locks the handle in the forward position during sustained fire to prevent injury to the operator. (c) UPPER RECEIVER AND BARREL ASSEMBLY. 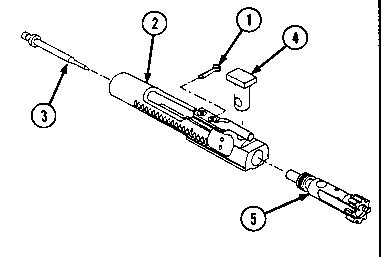 Provides support for the bolt carrier assembly. The barrel chambers the cartridge for firing and directs the projectile. LOWER RECEIVER AND EXTENSION ASSEMBLY. Provides firing control for the weapon and provides storage for basic cleaning materials. @ CARTRIDGE MAGAZINE. Holds cartridges ready for feeding and provides a guide for positioning cartridges for stripping. Provides quick reload capabilities for sustained firing. 1-13. CORROSION PREVENTION AND CONTROL (CPC). CPC of Army materiel is a continuing concern. It is important that any corrosion problems with this item be reported so that the problem can be corrected and improvements can be made to prevent the problem in the future items. While corrosion is typicalIy associated with rusting of metals, it can also include deterioration of other materials such as rubber and plastic. Unusual cracking, softening, swelling, or breaking, of these materials may be a corrosion problem. If a corrosion problem is identified, it can be reported using Standard Form 368, Product Quality Deficiency Report. Use of key words such as "corrosion", "rust", "deterioration" or "cracking" will assure that the information is identified as a CPC problem.